Mr & Mrs Belshaw were delighted with their new kitchen, thanks to the innovative approach of designer Simon Thomas at Kitchen Design Centre. 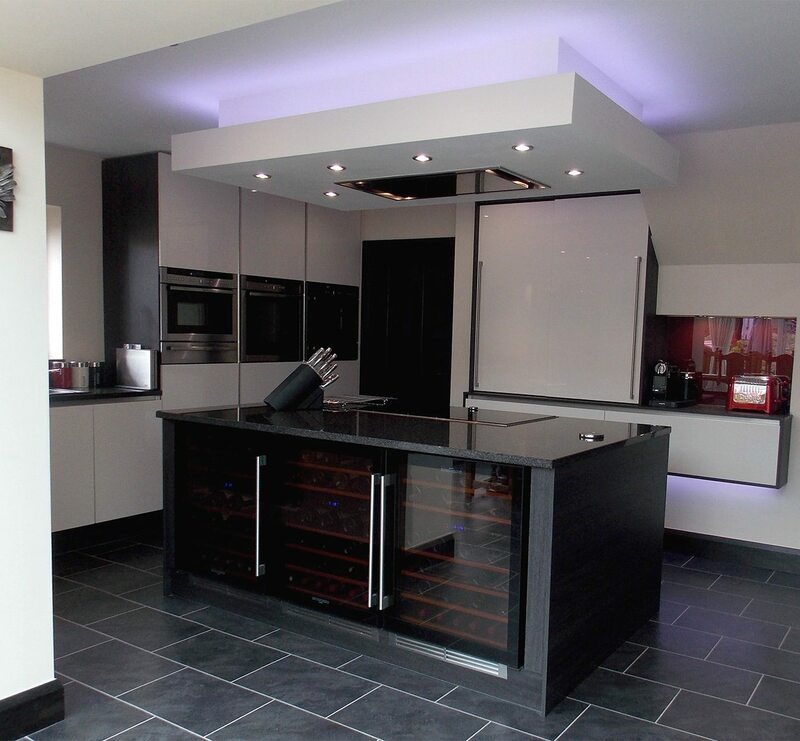 As a local joiner, Mr Belshaw was confident with his own design skills – until he was introduced to the unique and creative ideas that Kitchen Design Centre had to offer. Mr & Mrs Belshaw had just purchased their new home in the area of Barrowford and the kitchen design was part of a larger renovation. 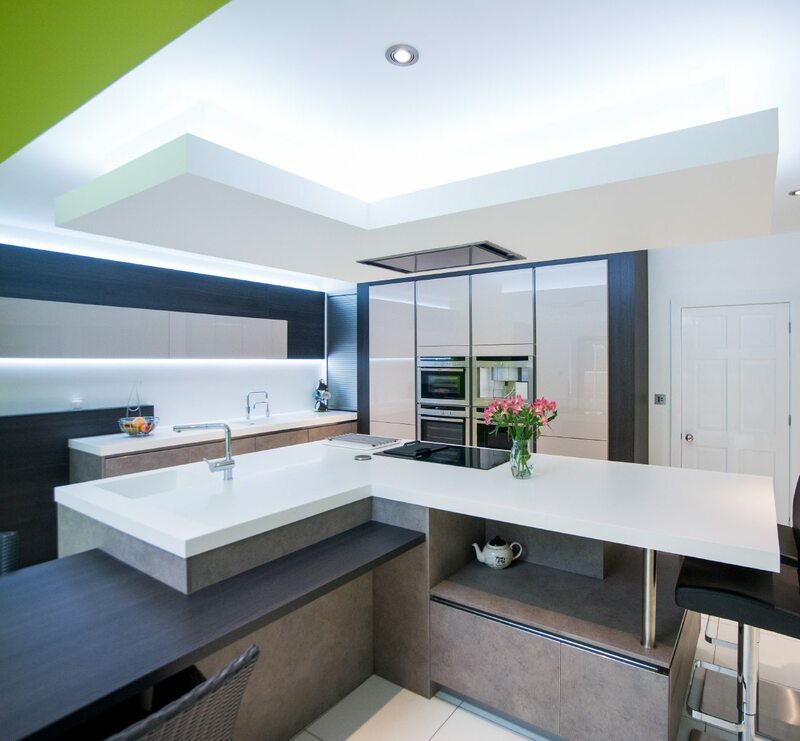 To ensure quality design and workmanship, the couple decided to enlist the help of award-winning Kitchen Design Centre in Colne. 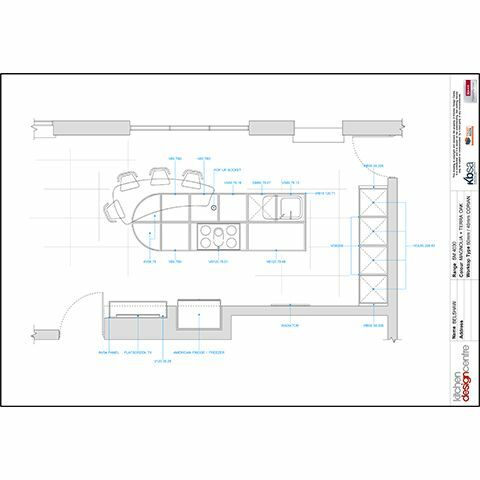 Mr Belshaw had envisaged a large, classic L-Shaped-styled kitchen. However, after sitting down and speaking with designer Simon Thomas, he soon realised that there was much more that could be done to unlock the room’s full potential. 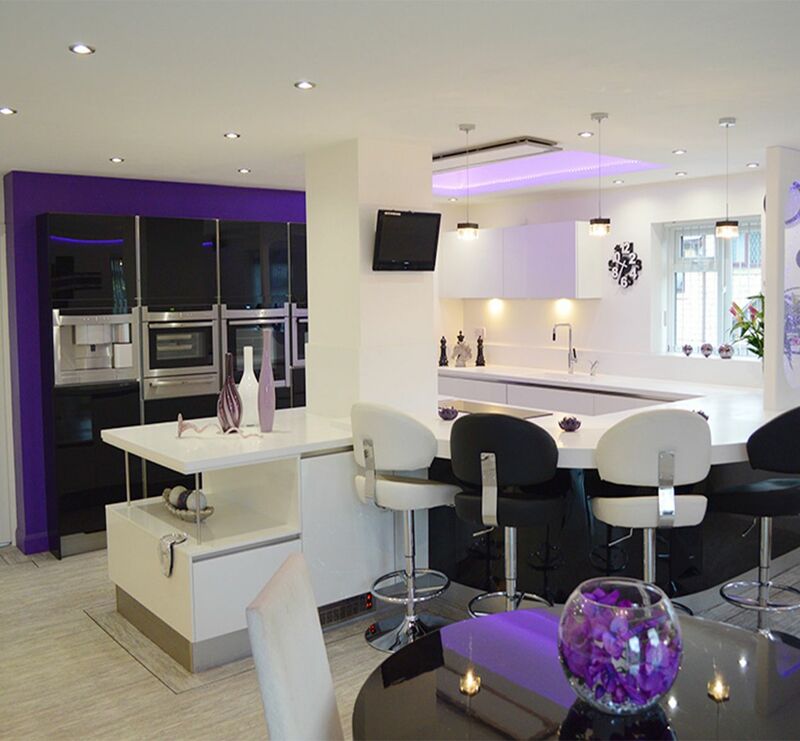 With a large island work surface consisting of a bespoke, elliptical bar, a row of tall units to house appliances, LED lights and a wall-mounted television, the room feels spacious, comfortable and practical. 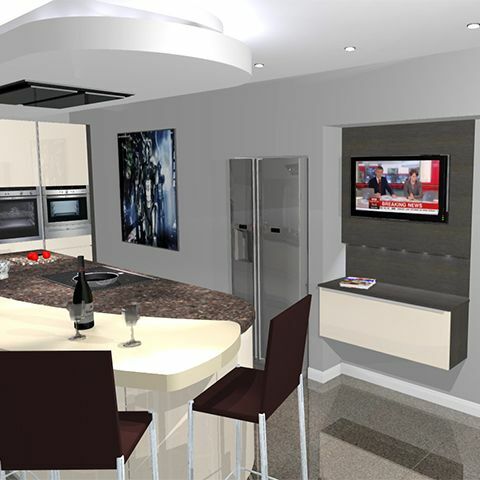 The Kitchen Design Centre kitchen is equipped with the latest state-of-the-art Neff appliances. This includes an induction hob, a combination-steam oven, two slide-away door ovens, a combination microwave and an American Fridge/Freezer. The kitchen was also installed with a Quooker, designed to allow instant boiling hot water. The cooking appliances provided by Kitchen Design Centre are equipped with features and finishing touches, which are designed to make cooking easy and pleasurable. The central island also consisted of a pop-up plug socket, which is a discreet way to source power. Mr & Mrs Belshaw decided on Corian worktops. Corian is a man-made product with a satin-like finish. 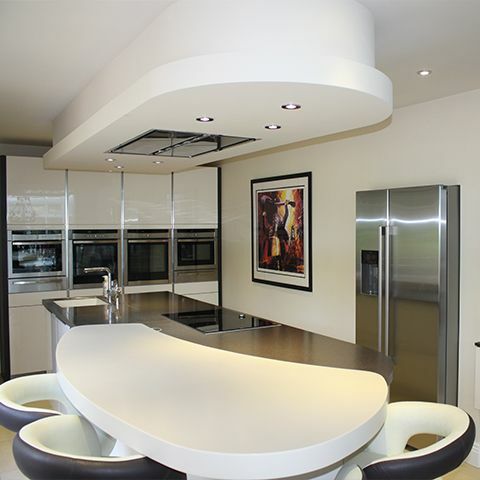 Corian is extremely stain resistant, and is also easy to maintain and keep clean. The kitchen units have lacquered finish doors. Lacquer is a water-soluble and solvent-free alternative to paint. Mr Belshaw said: “Initially, we were worried there would not be enough storage space available. However, the fantastic design provided has allowed for more than sufficient cupboard space. Everything is to hand and accessible. Shortly after the installation of their kitchen, Mr & Mrs Belshaw attended a Neff MasterClass cooking evening, which was held at Kitchen Design Centre’s Colne Showroom. This regular event is a demonstration on how to use Neff appliances. "I absolutely fell in love with the designs that Simon suggested. It was something totally unique and different. 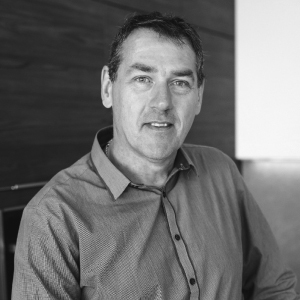 It turned out that his design ideas fitted in exactly with what I wanted to achieve." "With the shape of the existing room, the curvaceous island and bar added a complimentary design statement. The innovative design enables practical and accessible flow between the surrounding rooms."